There are 5 people in my IT team at work and happy Monday to me – 3 of them called in sick while the 4th had to leave early! Apparently there’s a nasty flu-like thing infecting our department and I spent most of the day juggling 43 tasks at once. The good thing is that time flew by fast, before I knew it the day was over. But the day fried me and I was drawing blanks on what to do for dinner when I got home – enter the huge salad. 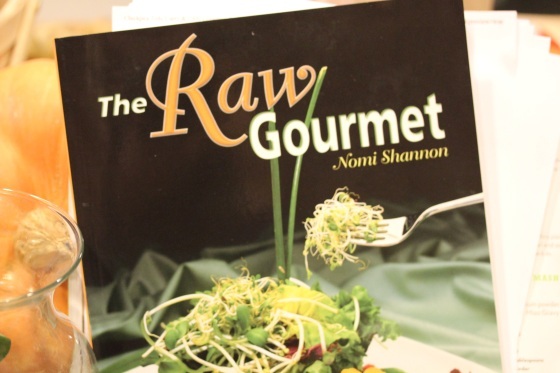 I flipped through my raw recipe books for a new dressing to try and landed on the Notmayo dressing recipe from The Raw Gourmet. It intrigued me because it’s loaded with cashews, an indulgence I was ready for after yesterday’s long run and today’s stress. But instead of juicing a lemon, it called for a peeled and chopped lemon, which was a new experience. 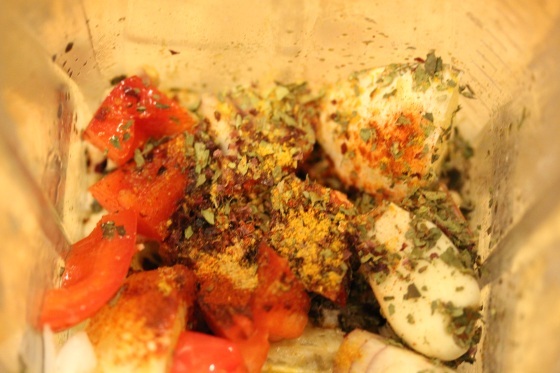 Other ingredients included dulse flakes, minced onion, chopped red pepper, oregano and paprika. I just had to try the crazy flavor combo. All the ingredients were easy enough to through into the Vita-Mix, even though I cheated not soaking the cashews first. And the end result looked very creamy and rich, perfect for the shredded jicama salad I was throwing together. And adding this odd mutant carrot too. Mmmm, lots of creamy salad goodness. My Oxo Julienne peeler is fun to use on jicama turning it into a crispy, slaw-like texture. And one medium jicama filled a large bowl with shreds making this more like a 6-serving salad. 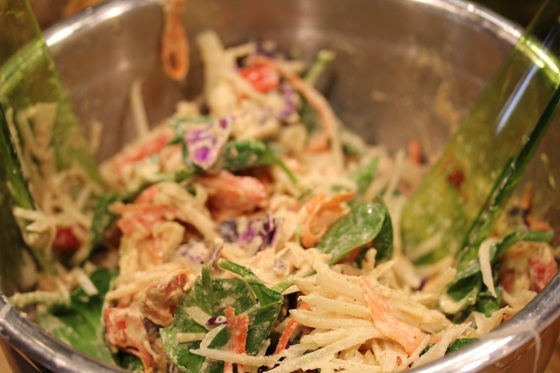 I also added sauerkraut to the salad and it’s flavor was complimented nicely by the rich and savory dressing. The dressing itself was like a savory mayo/aioli with a slight spicy garlic, peppery punch. It also coated the salad beautifully. Also, don’t forget to enter my CSN giveaway if you haven’t yet. Looks great! The dressing sounds delicious. I’m always tempted to add sauerkraut to salads but I’m never sure it will taste right, but with a lemony dressing like this it sounds really good. 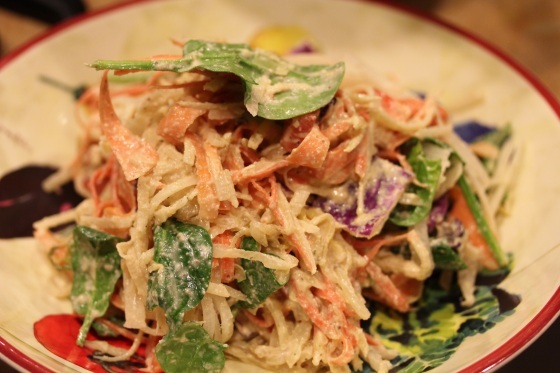 Sauerkraut goes really well with savory salad dressings, I love it with avocado, tahini and curry based dressings. By itself, it’s a little strong for me, but great mixed through a salad. 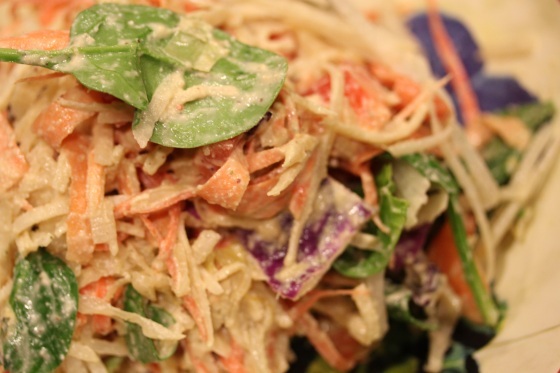 Your shredded salads always look so yummy! so sorry you are playing catch-all cover everyone’s jobs employee. ugh. 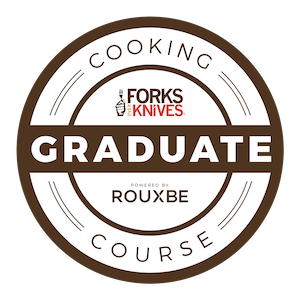 That was actually the first time I opened that book sadly, but it has a lot of great recipes in it I need to try. Ugh, nothing worse than being the last woman standing! I had a “Monday,” too. Here’s hoping for a better rest of the week. The dressing looks great! I don’t have that cook book but I think morning I’ll just toss in some of the ingredients you mention and see what I come up with. I’ll toss it on some kale and cabbage and take a big a** salad to lunch! So true! Sometimes being the overly healthy one is a curse! :-) Love big salads for lunch and I have plenty of leftovers from this one for today’s lunch. That salad dressing looks great. 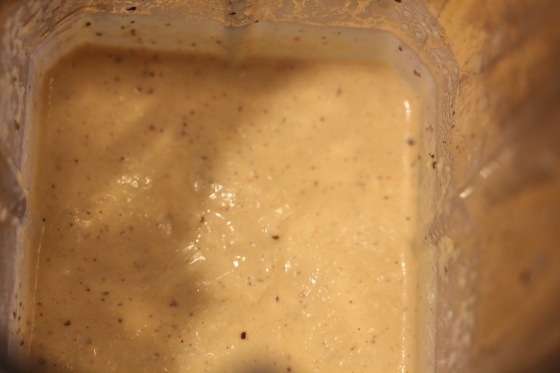 I really like cashews, but my cashew dressings never look so smooth and creamy. Is this because the Vitamix? Whether I put cashews in the blender or the mini-chop, the texture always comes out chunky. The Vita-Mix does a great job at creaming cashews, but other blenders should work too. Try soaking the cashews for 8 hours before blending and adding a little more liquid to the blender. 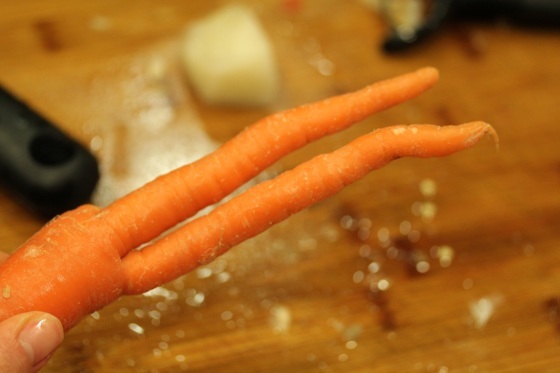 Ahhh, two-legged carrot! I love my julienne peeler too! Hope things calm down at work today! wow what a fabulous meal after a stressful day! i would love to enjoy that even for breakfast :) lots of people have been out of my office too and it makes it so hard. Ugh, what a stressful day! I think one of the best parts of not working in an office is that I never have to deal with things like that! I’m totally on board with that flavor combo. I love cashews…a lot. Sometimes soaking them makes a difference and others it doesn’t. Looks like with this recipe it came out super creamy even without soaking! No co-worker pranks from me….I work solo, so I don’t even know where to begin with that one!